This piece originally appeared in the Irish Independent. Books make stand out Christmas presents. They are gifts that outlast fad games or toys that need dozens of batteries to keep them chirping. Children are spending increasing amounts of time on screens and books are a way of counteracting that, they feed the soul and ignite the imagination. It’s important to introduce books early in a child’s life, pop a board book in your baby’s pram, leave them on the floor with your toddler’s toys and always carry a favourite picturebook in your bag to share when you’re delayed in a queue. The greatest gift you can give a child is the gift of reading. But with bookshop shelves a-groaning with titles, what books should you give them this Christmas? Every year I read hundreds of children’s titles, discovering outstanding picturebook gems and novels so good they make me stop and wonder. I’ve selected my favourite titles in each age group. If you’re looking for a personal recommendation for your child, check out #bookelves17 on Twitter or Facebook, run by a team of children’s book experts including myself. Happy reading this Christmas season! 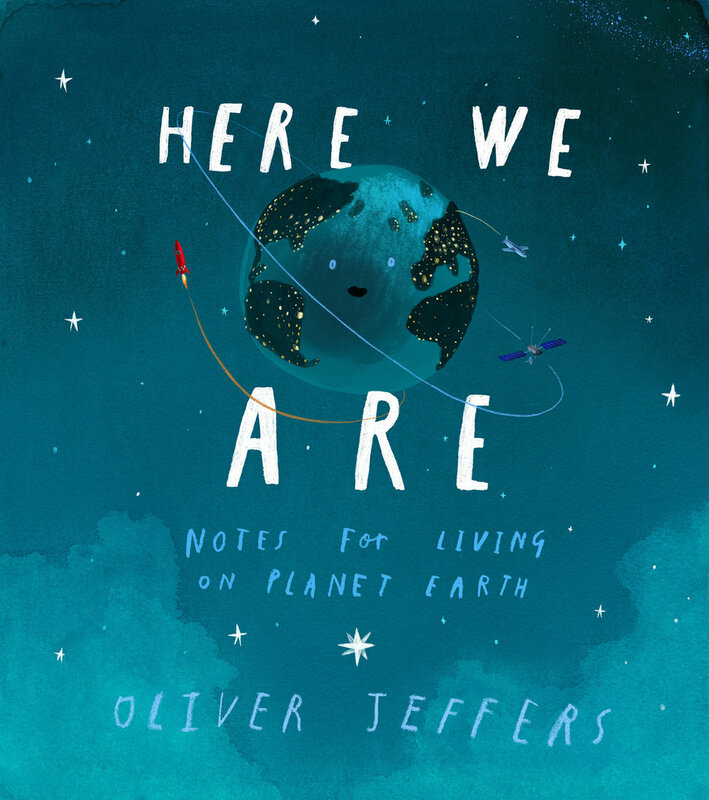 Oliver Jeffers wrote this ode to kindness for his baby son, Harland. ‘Well, hello,’ it begins. ‘Welcome to this planet. We call it Earth… It looks big, Earth. But there are lots of us here so be kind.’ He walks the reader through space, land, sea, people, animals and so much more. Each double page spread is carefully designed and majestically coloured, with a sweeping New York city scene, complete with the Brooklyn Bridge (Jeffers lives in Brooklyn), and a spread showing all the different kinds of people who live on our planet. Outstanding, don’t miss it. If you buy one board book for a tiny tot this season, make it this beauty by an award-winning Irish picturebook maker. The owl family and the bat family share the same branch but they never mix. When a gust of wind blows everyone into the air, things start to change and both families find that having new friends makes life better. There are no words in this book, the expressive illustrations, full of gentle humour tell the story. 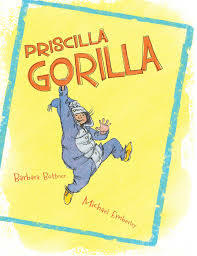 This handsome hardback is beautifully crafted with vibrant illustrations and a cracking story that will make you smile. 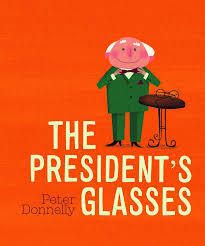 The President of Ireland (who with his dapper suit, bow tie and glasses bears a striking resemblance) is on his away across Dublin city to sign a very important document but he’s forgotten his glasses. Luckily the President’s pigeon is on hand to save the day. 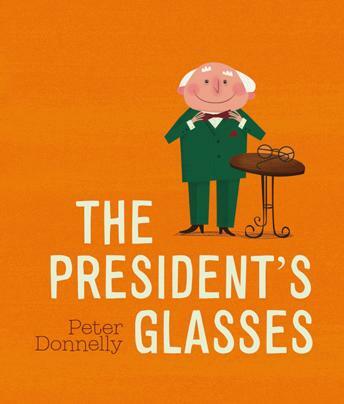 It’s hard to believe this is Donnelly’s first picturebook, it’s full of confidence and visual swagger and would make the perfect present to send to Irish families living around the globe. Move over Julia Donaldson, there’s a new picturebook poet in town. ‘This is Sid Gibbons. And this is his mum. And this is the reason they’re looking so glum.’ So begins this tale of one boy and his imaginary friend, Kevin. Written in highly infectious rhyme, Biddulph is also an accomplished artist, and this hardback picturebook is a treat for the eye. The perfect book to read (and re-read over and over) at bedtime. The third in the hugely popular Oi! series, this bright, lively picturebook combines hilarious rhyme with a whacky story which follows different animals and what they are ‘supposed’ to sit on: the pony on macaroni and dingoes on flamingos. Ideal for reading aloud and bound to make any child laugh. Sheena Dempsey is an award-winning Irish illustrator and her artwork makes this sweet picturebook featuring young children doing different yoga poses come alive. The rhyming text is easy to follow and if there’s a yoga loving mum or dad in the family, this is the perfect book for the whole household. 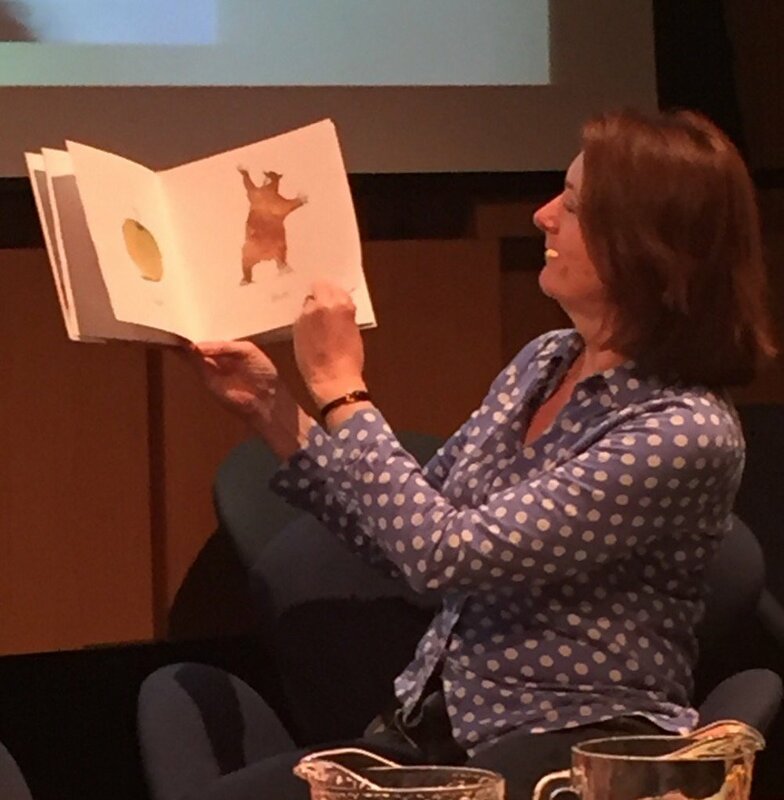 Sheena Dempsey also illustrated Irish author, Jane Landy’s debut, Ginger the Whinger (Golden Key), a rhyming picturebook about an annoying dragon and the family he visits. Luna loves library day as she gets to spend time with her dad. Together they pick books about dinosaurs, mini monsters and magic for Luna to take home. They also read fairy tales together, Luna snuggled on her dad’s knee. An ode to different kinds of families, with lyrical text and richly coloured, warm illustrations. A joyful whirlwind of a book about birds of all shapes and sizes which begs to be shared with young eyes. The jaunty rhyming text is brought vividly alive by the outstanding illustrations which zing with delicious colour. Rabbit is having a ‘lovely sleep’ when a terrible noise wakes him. He discovers a woodpecker banging holes in a nearby tree and, buzzing with anger, he ropes in his friend, Bear, to deal with the disturbance. Bear is a kind, clever fellow who manages to find a happy solution for all. ‘Maybe you could just think about the world differently,’ he tells Rabbit. ‘Maybe you could … accept it … Not try to change it.’ With engaging illustrations by Jim Field, this warm, funny friendship tale has the philosophical wisdom of Winnie the Pooh. An outstanding book that has all the hallmarks of a modern classic. When Pug’s owner, Lady Miranda sets off on safari, in a sedan chair carried by her Running Footmen, she brings Pug with her. But they have to settle for a trip to Animal Adventure Land. Here they have all kinds of fun adventures of their own. Full of gentle humour and cracking illustrations with lots of vibrant green and yellow, this book makes a fantastic read aloud or is perfect for children just starting to read for themselves. Irish author, Erika McGann captures the spirit of the Secret Seven in this good natured mystery for young readers. The Bubble Street Gang set up a new clubhouse but someone has discovered its secret location. It’s up to the gang to find out who the interloper is. 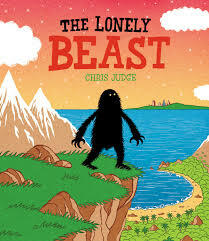 If you’re looking for a picturebook that combines clever design and illustrations with a cracking story, this is it. 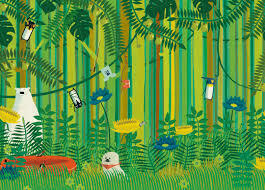 David Mackintosh designs Lauren Child’s books and his eye for detail is exceptional. A stink bug has attached itself to a girl’s arm and refuses to let go. But sometimes even bugs need a friend. ‘I was lying right there, deep in my dreams in this very basket, when I was woken up by the sound of wind roaring.’ The narrator of this clever version of the Wizard of Oz is Dorothy’s dog, Toto, who is telling the story to a basketful of his own puppies. The illustrations are gently coloured, bringing this adventure tale to vivid life for younger readers. Ideal for reading aloud at bedtime or for a young reader to gobble up for themselves. Twelve-year-old Olive and her little brother, Cliff have been evacuated from London to the coast of Devon, much to Olive’s disgust. She wants to help the war effort, not be stuck in the countryside. But when she finds a mysterious note in the pocket of the coat she has borrowed from her sister, who has disappeared, slowly she starts to piece together an important war related mystery. A wonderful book, full of heart, with some cracking characters and a gripping plot. I’ve read lots of World War II books for children and this is one of the best – don’t miss it. When a group of children find themselves in the Amazon rainforest after a terrifying plane crash, they come across signs in the jungle that someone or something has been there before. Rundell’s research – she travelled to the Amazon and swam with pink river dolphins – shines out and this is a beautifully written novel, filled with vivid descriptions and plucky, clever children. And for younger children of age five plus, her illustrated book, One Christmas Wish, illustrated by Emily Sutton is also a must. Ted has a unique way of looking at the world which enables him to work out mysteries and puzzles like no other boy. When his aunt is accused of stealing a priceless painting from the Guggenheim Museum in New York, it’s up to Ted and his sister and cousin to figure out who really stole it. I read this warm, smart book in one sitting, it’s truly gripping. It’s the sequel to The London Eye Mystery by the late Siobhan Dowd but can be read as a stand-alone too. This gem of a book is something very different, magical realism for children with outstanding black and white illustrations by Levi Pinfold. Set during World War II, Emmaline is living in Briar Hill, a hospital for children with TB or ‘stillwaters’ as she calls her condition. When she starts seeing winged horses in the hospital’s mirrors, she is determined to find out where they come from. Shepherd’s writing is flowing and lyrical and this story utterly gripped me from start to finish. Ideal for a thoughtful reader who loves Michael Morpurgo. Eleven-year-old Morrigan Crow is a cursed child, blamed for everything bad that happens in her town and destined to die at Eventide. A strange man called Jupiter North whisks her away to Nevermoor, saving her life. But she can only join the Wundrous Society, a place of magic and protection, if she passes four impossible trials. A ‘wunderful’ book, full of imagination, ideal for Harry Potter fans. As a former bookseller, I love novels set in bookshops. This one is the story of Property Jones whose family win the Montgomery’s Book Emporium. 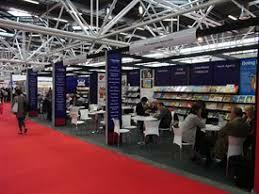 They are thrilled and set about running this huge, sprawling bookshop. But something is very wrong in the Emporium and soon their livelihood is in danger. Although Property can’t read – a secret she has kept from her loves ones – she is super smart and works out how to save the emporium. A warm and magical story, ideal for young bookworms. When animal lover and champion Irish dancer, Sam, gets stuck inside the body of her neighbour’s dog, no-one could predict the consequences. How will she cope with school and take part in an Irish dancing competition when she’s stuck inside a big hairy dog’s body? Nolan has a light touch and this funny book is full of heart. Perfect for David Walliams fans. Also recommended: Bad Dad by David Walliams; Diary of a Wimpy Kid: The Getaway; Hetty Feather’s Christmas by Jacqueline Wilson; The Wizards of Once by Cressida Cowell; Darkmouth: Hero Rising by Shane Hegarty; Stand by Me by Judi Curtin. At the opening of this graphic novel, Ebo and his brother are in a small rubber dinghy, making the treacherous journey across the Mediterranean Sea from North Africa to Italy, hoping to start a new life together in Europe. Colfer cleverly weaves in Ebo’s backstory – from leaving his village alone and crossing the desert to find his brother - telling a tale of bravery and tenacity. Beautifully illustrated by Giovanni Rigano in rich shades of blue (for the sea) and red (for the desert), this is an outstanding book, told with honestly and heart. 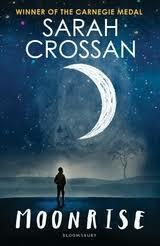 Eagerly awaited by fans of Pullman’s ‘His Dark Materials’, this book is a must for fans of that trilogy and is also an excellent introduction to this richly imagined world for new readers. The hero of The Book of Dust is eleven-year-old Malcolm who works in his parents’ pub and this new book explains how Lyra, the hero of the original books, came to be saved from her enemies and to live at an Oxford college. An immersive, old-fashioned fantasy adventure, full of drama and magic. 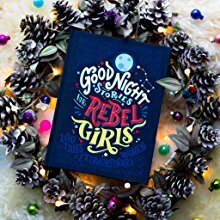 I read this book in one heady gulp, captivated by its teenager narrator, Stella and her longing to be someone and do something important, something young teens will deeply relate to. 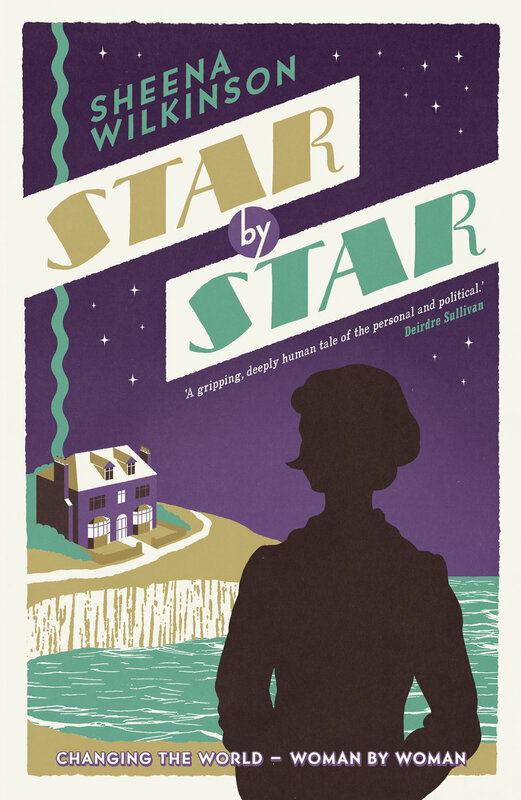 Set in 1918, women have recently won the vote and Stella’s mother, a loyal suffragette, has just died from the flu pandemic, before she gets the chance to vote herself. Stella wants to mark her mother’s life in some special way but is frustrated by her small, quiet life. Can she make a different, no matter how small? A joy from start to finish, this book is narrated by the remarkable Sally Jones, an ape with profound insights and ability. Sally and her friend and saviour, Henry Koskela, the ‘Chief’, run a cargo ship and when one of the enterprises goes badly wrong, the Chief is falsely convicted of murder. Against all odds, Sally must fight to clear his name. An adventure tale like no other, a story to get truly lost in. Pitched as ‘The Martian’ for teenagers, this epic space adventure is gripping. Born on Moon 2 Space Station to an astronaut mother, Leo has never been to Earth. Now he and fellow space baby twins, Orion and Libra are preparing for their first trip home. But their journey has far reaching consequences. A heady blend of science fiction and mystery, written with confidence and verve. Ghalib and his family live in Kobani, a town in Syria near Aleppo. After daily attacks by ISIS his family decide to flee the bombings and travel by minibus to Aleppo where they start the long and arduous walk towards the border with Turkey. Mitchell spent a week volunteering at the Jungle Camp at Calais and her descriptions of the camp ring with authenticity and truth. A striking, honest book with real heart. Winner of many prestigious awards for her previous young adult novels, Sarah Crossan is one of our most accomplished writers. This book packs a devastating punch. Joe hasn’t seen his brother for ten years. There’s a good reason for this, Ed is on death row. With the execution date set, Joe travels to be with his brother, against everyone’s advice. What he hears and learns will change his life forever. Written in free verse, this compelling, thought-provoking novel is a book I will never forget. When sixteen-year-old Starr’s unarmed best friend, Khalil is murdered in front of her by a US police officer, she’s thrown into turmoil. What she knows could get her killed but is she brave enough to speak out? A powerful and moving novel written with urgency and passion, with some of the most vividly real characters in any YA book I’ve ever read, it’s a must read. A beautifully produced collection of dark, feminist fairy tale retellings with sinuous line drawings by Karen Vaughan. Many of the tales are written in the second person, which is a hard voice to pull off but Sullivan does it with aplomb. From The Frog Prince (‘Doing Well’), to Cinderella (‘Slippershod’), her sinuous, lyrical writing will have you transfixed. John Green is best known for his previous bestseller, The Fault in Our Stars which was made into a successful movie. This book features a mystery at its heart, missing millionaire, Russell Pickett and the scramble to find him and receive the $100k reward. The story is told by Aza, Holmes, a sixteen-year-old with anxiety. Aza knew Russell’s son, Davies as a child and when they are reunited she falls for him. Although it can be a little slow in places, Green really understands teenagers and Aza is beautifully drawn. Don’t be put off by the sombre cover, this is a strong mystery story set in Belfast by an experienced Northern Irish teacher who certainly knows her teens, her main character’s voice is spot on. Ben is determined to uncover a family secret so he gets himself sent to a centre for troubled youth, Knockmore Farm. Here he finds out more than he bargained for. I adored this bright, sparky book with its strong characters and knock out plot. It’s the tale of three young women whose lives are changed by the suffrage movement in England. Each is very different and two of them fall in love (with each other). There’s May, a Quaker and pacifist, factory worker, Nell, and Evelyn, who has a devoted and largely supportive boyfriend, Teddy. Nicholls deftly handles a wide range of topics – empowerment of women, poverty, sexuality – in this warm, wise novel. If the child in your life loves trains, this quirky picturebook is perfect. It’s packed with simple facts and vibrant illustrations that leap off the page. If your child loves animals, this is the perfect gift, a generously sized hardback featuring all manner of life, from beetles and spiders, fish and whales. The delicious watercolour and ink illustrations by newcomer, Lorna Scobie are a joy to share. The award-winning father/daughter team behind Irelandopedia and Historopedia which have sold over 100,000 copies is back, this time with a romp through the world of the Irish language from arán to zú. Suitable for all levels of Irish, it covers topics like the weather, clothes and sport in glowing colour. If your child is interested in history, this charming story of one remarkable family is ideal. Born in Cork, the Boole sisters went on to become novelists and scientists, defying conventions of the time. Jaunty writing combined with fun illustrations make this a great introduction to women’s history of ‘herstory’. See below for more great ‘herstory’ books. Originally produced using crowdfunding of more than a million dollars – the most funded original book ever – this illustrated book has become a phenomenon, inspiring dozens of women’s history (or ‘herstory’) books for children. Our own Grace O’Malley is in the mix, along with well-known pioneers and activists such as Helen Keller, Malala, Rosa Parks and many other women who may be new to readers. Watch out for Good Night Stories 2 in early 2018, plus some Irish ‘herstory’ books from Little Island and O’Brien Press, published to celebrate the centenary of Votes for Women in Ireland. ‘For adder is as adder basks.’ A fascinating book of ‘spell-poems’ designed to ‘re-wild the language of children’. The illustrations alone are a work of art. Both Mcfarlane and Morris see nature as strange, beautiful and magical and these lyrical poems and accompanying watercolours are ideal for reading aloud and sharing with children (and adults) who still have wonder in their hearts. This striking book brings together fifty women from the world of science, from Marie Curie to Jane Goodall. Although the book is quite text heavy, there are lots of quotes and snippets of information on the pages, and the biographical information never seems overwhelming. What makes the book a real winner is the distinctive design. Each spread has a saturated black background and Ignotofsky uses one bright colour to highlight the women’s portraits and the text. ‘The whole universe is out there. And it’s waiting for you.’ This attractive hardback chronicles the lives of the women behind the Apollo space missions, from Valentina Tereshkova, the first woman in space (June 1963) to Peggy Whitson, who has completed ten moon walks and holds the record for the most days in space by an American astronaut. Jackson is a space expert and the exuberant illustrations by students from the London College of Communication send this fascinating book into orbit. Sarah Webb is a children’s writer and creative writing teacher. 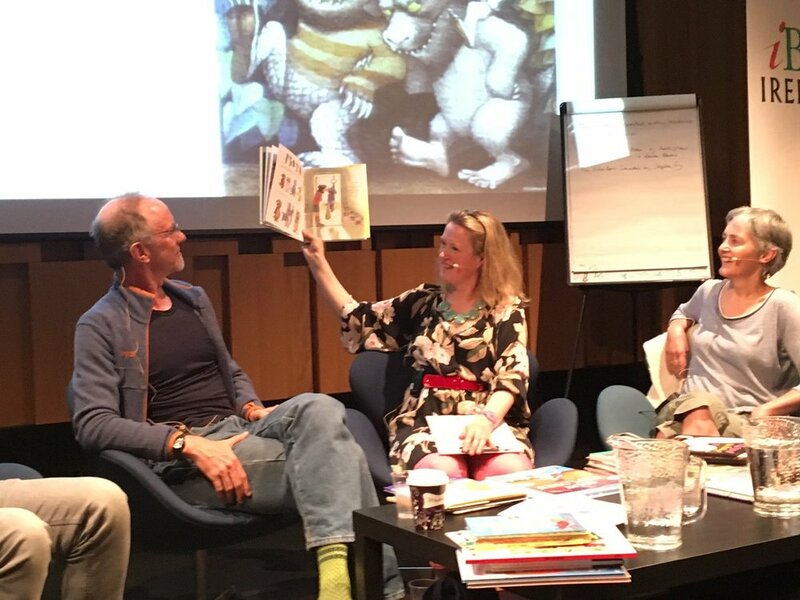 She is also the Children’s Programmer of the ILFD (International Literary Festival Dublin) and her latest book is A Sailor Went to Sea, Sea, Sea: Favourite Rhymes from an Irish Childhood, illustrated by Steve McCarthy. I was at a lunch party last week. It was being held to celebrate the end of the sailing season so many of the people there spend their weekends and free time sailing competitively. I haven’t spent 20 years busting a gut writing over 30 books to be told it’s a lovely little hobby. But then he said the one thing that’s like a red rag to a bull for me: ‘I’d write a book if I had the time’. And to give him credit he didn’t excuse himself and run away quickly, he said ‘Actually, you’re probably right. Maybe it’s not top of my list at the moment.’ And he told me about a TED clip about time and using it wisely. Nice man in fact, very engaging to talk to. After the party I watched it and it makes so much sense – it’s by Laura Vanderkam and she’s written a book about time management and using your time wisely. You can find the clip at the end of this blog post. Laura and I both believe the same thing – that if you want something badly enough, you’ll make the time. For many years now I’ve been teaching and mentoring children’s writers and many of them have packed lives – they are pilots, librarians, teachers, business women; they are minding children with extra needs or caring for parents. Yet they make the time to write and attend classes or mentoring sessions. They make writing their top priority. If you meet me at a party and tell me you’d love to write if you had the time – and yet you find the time to sail, or watch tv, or hang out on Facebook – good luck to you! 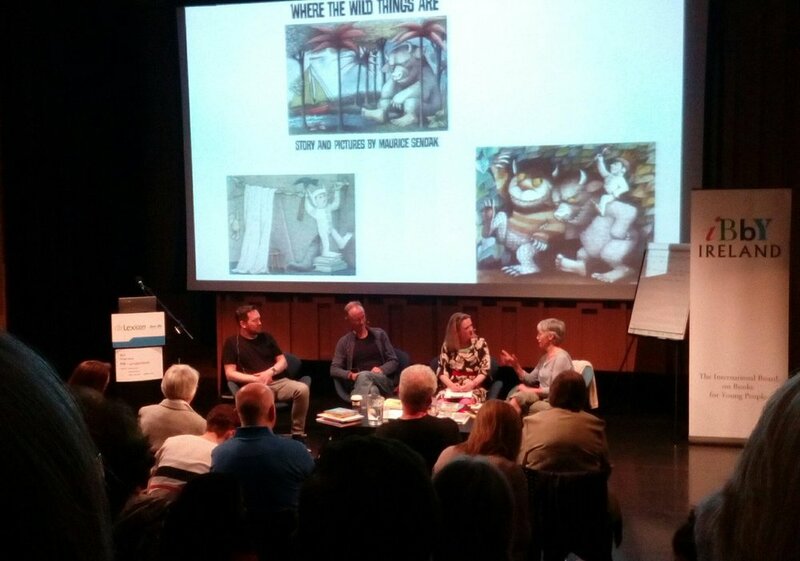 Last weekend I attended the CBI (Children’s Books Ireland) conference in the Lighthouse cinema in Smithfield, Dublin. The conference is always well attended by writers, illustrators, teachers, librarians, booksellers, publishers and children’s book lovers and one of the great pleasures of the weekend is talking to fellow book fans. She also feels strongly that Maisy is just Maisy, not a boy and not a girl and spoke about gender in children’s books and how we should just let children be children. Hear, hear! It took her 5 years at art college to find her style and to be confident with colour. A project designing cups and plates for a children’s party led to her discovering that she should use the colours she liked. Lucy has a set routine. ‘If I didn’t have a routine I wouldn’t work, I’d potter around all day,’ she said. She works on her creative projects in the morning and does her admin in the afternoons. 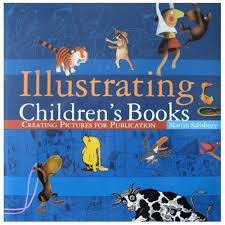 Rob likes picturebooks as he gets control over his work. He likes rhyme as it’s ‘mathematical’ and follows a pattern. It helps children join in, he explains. It takes Chris between 1 day and 2/3 weeks to do a picturebook spread. He has been known to complete a book in 3 weeks. Anna Carey and Lucy Adlington spoke about writing historical novels. ‘Research is endlessly seductive but writing’s hard work,’ Lucy said. The details ground your story but you don’t have to put all your research in, she explained. Her new book, The Red Ribbon sounds fascinating, a World War II book about clothes and the Jewish seamstresses who created them. Anna spoke about her Irish suffragette books set in the early 20th century, which she wrote because she wanted to read about teen suffragettes herself. She tries to make history interesting for modern readers by using a light hand with her research and plenty of humour. Her book, The Making of Mollie is well worth seeking out. 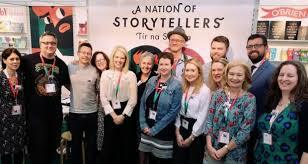 John Boyne, Cecelia Ahern and Shane Hegarty talked about writing for different age groups. He also said ‘I’m always open to story.’ And he finds the balance between writing children’s books and books for adults works well for him. Kate DiCamillo gave a stirring talk about the wonders of the world. She spoke about a childhood trip on an glass bottomed boat and the secret world under her feet, of fish and turtles. A woman on the boat took her arm and said ‘Oh my, this world!’ and it’s always stayed with her, she explained. She’s a big fan of Charlotte’s Web by EB White, a book that can bring people together. Kate writes 6/7/8 drafts before sending her work to her editor. Then she gets a 10 editorial letter back. She spends the day sulking: ‘If you know so much why don’t you write a book?’ and then she gets to work. Do not give up – the race goes to the idiot who will not give up. 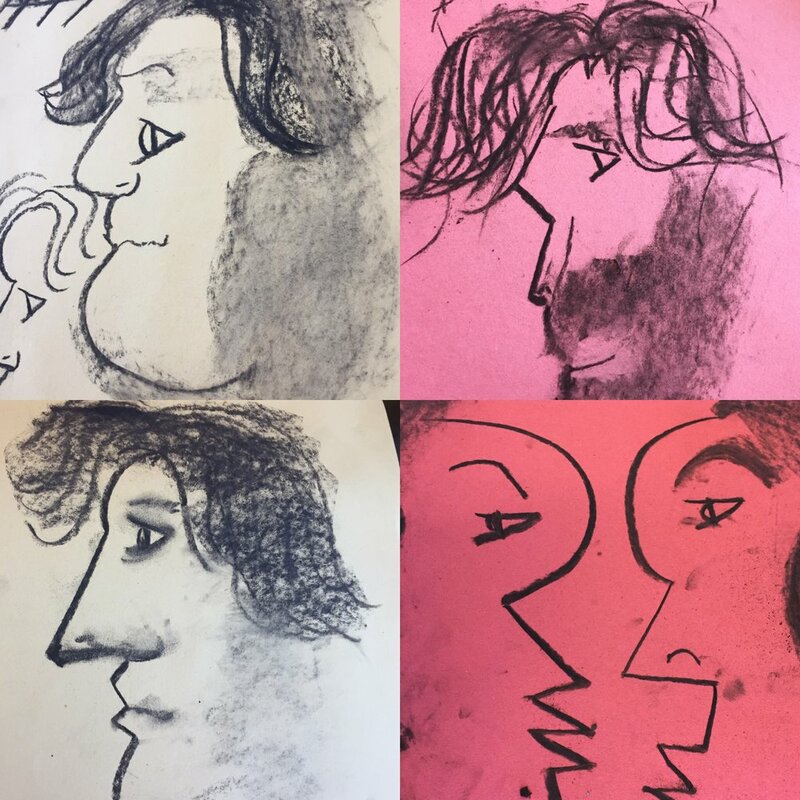 Poet and picturebook writer, Joseph Coelho attended a comic writing workshop at ITV when he was a child and was told he was a really good writer – this was the 1st time someone had seen him as a writer. He is passionate about libraries and how they can change children’s lives. They certainly changed my life, he said. The New Voices panel featured nine different new children’s writers who read their work with gusto. She shared her journey with the audience – a journey from darkness into light – and talked about how books can help children make sense of the world and be seen. It was a most stimulating and though-provoking weekend and thanks to all at CBI for their hard work in putting the conference together. A very wise New Zealand writer and bookseller called Dorothy Butler once said ‘Babies are never too little to look’ and she’s right. And they are never too little to listen. From birth they can distinguish between different sounds, and as they grow, they will try to replicate the sounds they hear and begin to make sounds of their own. There are three times as many words in a children’s book than we use in everyday language. Reading aloud to your child is a brilliant way of teaching them new words, and it’s also deeply soothing for them to hear your voice. A good nursery rhyme collection is a great place to start. When I went looking for a collection that contained the rhymes and songs that I had heard as a child in Ireland I couldn’t find one, so I decided to put one together myself. That book, Sally Go Round the Stars: Rhymes and Songs from an Irish Childhood (with Claire Ranson and Steve McCarthy), was a bestseller, and this autumn sees a second collection published, A Sailor Went to Sea, Sea, Sea, with lots more Irish and international favourites, from She’ll be Coming ‘round the Mountain to The Owl and the Pussycat . So when you’re sharing nursery rhymes and songs with your baby or toddler, as well as having fun, you’re also helping them learn and develop. Happy reading! Clear, uncluttered pages with bright colours, or striking black and white illustrations. Avoid fussy books with too much action on the page. Illustrations and images that a baby will recognise from everyday life – pets, people, cars. Sarah Webb is an award-winning champion of children’s books and a writer for both children and adults. Her latest book for children is A Sailor Went to Sea, Sea, Sea: Rhymes and Songs from an Irish Childhood (O’Brien Press) with Steve McCarthy. Sadhbh Devlin is an award-winning blogger, a television researcher for Irish language television channel TG4 and the craft contributor to Easy Parenting magazine. She also reviews Irish language children’s books for Inis magazine. You can find her making crafts and playing with her young twins on her award-winning blog: www.wherewishescomefrom.com or writing about her adventures in children’s literature here: www.sadhbhdevlin.ie. Bí ag Spraoi Liom! 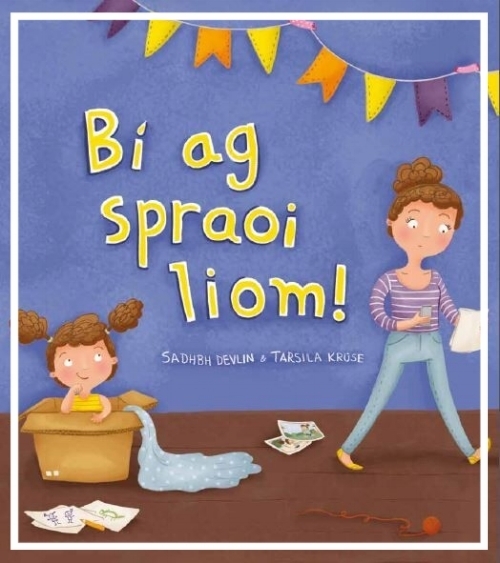 is her first Irish-language picture book for children. Can you tell us about your latest book, Bi ag Spraoi Liom and where the idea came from? Bí ag Spraoi Liom! is a story about Lúna, a keen inventor with one big problem; Mom is too busy to play with her in her new time machine. Luckily, Lúna is very clever and creative and hatches a plan to entice Mom to play with her. It’s a story that reminds us to make time for the important things in life. I was inspired to write it after a conversation with one of my twin daughters - who also happens to be something of an inventor - about the games I used to play as a child. Also, the fact that I always seem to be in the same position as Lúna’s ‘busy Mom’ definitely helped me to develop the concept! That’s actually a difficult one to answer. The story was originally created during a year-long mentorship scheme I had been accepted onto. I was lucky to have been assigned Tadhg Mac Dhonnagáin from Futa Fata as my mentor. 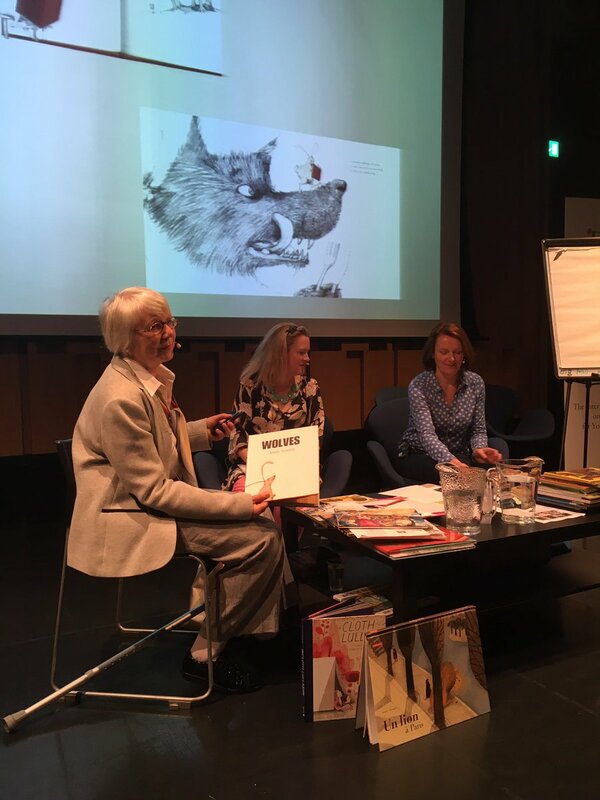 Tadhg is not only a publisher, but also an award-winning writer, so I really hit the jackpot in terms of learning everything there is to know about the picture book genre from the master! However, taking part in the scheme did not guarantee having anything actually published by Futa Fata. Tadhg was under no obligation to publish anything that was created during our sessions - but luck was on my side again, and at our last meeting on the scheme, Tadhg announced that he’d like to publish one of my stories - which was Bí ag Spraoi Liom! I was over the moon, not only to have had the opportunity in the first place but to have managed to find a publisher without having to go through the agony of the submissions process. After it had been accepted, it took another few drafts and a few edits during the illustration process to complete the story. In reality, it probably took a full year to go from concept to finished product. I mostly write when my children are in school but I always have a notebook with me. You never know when inspiration will strike. I had a home office until recently, when I was evicted by a child looking for a bedroom of her own, so I’m currently a bit of a nomad. I write at my kitchen table, on the sofa, at the library, or in various cafés. I should have a more permanent solution very soon though and I can’t wait! For picture books I write long hand at first. The idea or concept usually starts as a vague scribble in one of the many notebooks I carry around with me. I then flesh it out a bit before using note cards or post-its to work out the plot and to see where the holes are. Once I have a good idea of the structure and the concept I’ll get the text onto the computer. Then I’ll make a (very basic and terribly drawn) ‘dummy’ of the book to see if it will fit the picture book model. My stories are usually way too long at first so, after that it’s editing, editing, editing! One of the reasons I write long hand for picture books is that I have a terrible habit of editing as I go along when I’m typing - the result of years of blogging. 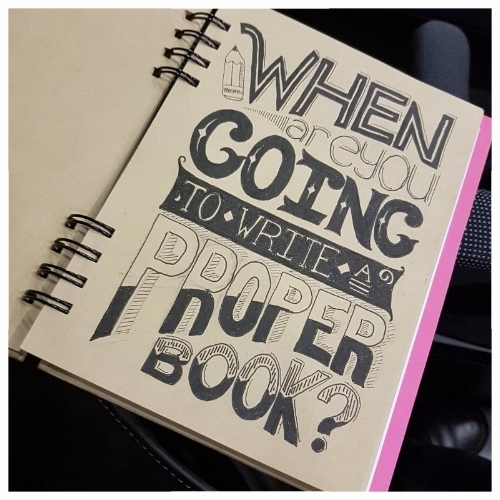 Blogging is ‘publishing’ at its fastest and I have a tendency to write a blog-post, editing and correcting as I go and hit publish pretty much immediately. Creative writing needs a completely different approach. For a picture book, where every, single word counts - you might need to write a sentence many, many different ways before you get it just right. For me, that habit of editing as I go, means I’d either never finish a first draft because I’d start fixating on everything that was ‘wrong’ in the first sentences or else I’d race to the end of the story without thinking about all of the different possibilities for developing the concept. For those reasons, editing comes quite late in my process. I prefer to get the ‘story’ down first and then start tweaking things. 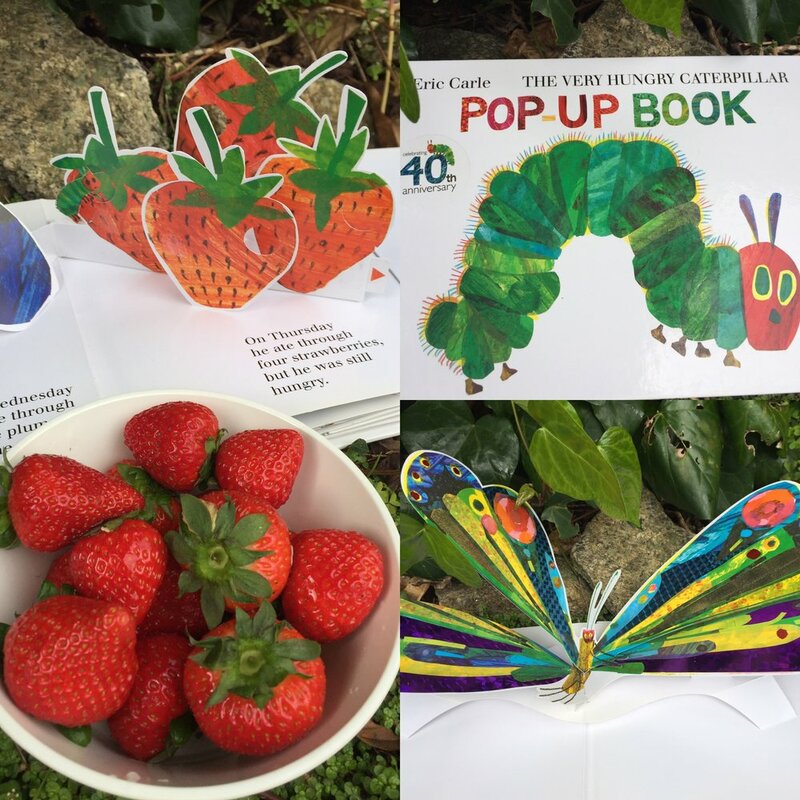 Picturebooks are notoriously difficult to write – did you find it tricky? They are tricky! I think people really underestimate how difficult writing for young children can be. It can be surprisingly technical - getting the pacing right, making sure there are ‘hooks’ to keep readers turning the pages, keeping the word count as low as possible - all while telling a story about a ‘hero’ who is relatable yet age appropriate and creating a world that children will want to visit again and again and that parents won’t mind reading about again and again! I definitely found it difficult in the beginning and made some extremely clunky attempts before I started to understand more about how picturebooks work, but like anything, with practice it gets easier. Although - that doesn’t mean I’ve stopped making clunky attempts! Do you have any advice or tips for people who would like to write a picturebook? My advice would be to read picturebooks. Read them for pleasure, of course, but also study them to learn about their structure and style and also about what kinds of things get published! 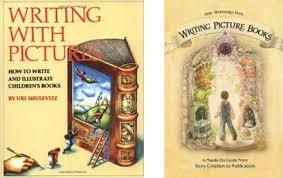 I also found ‘How to Write a Children’s Picture Book and get it Published’ by Andrea Shavick very useful when I was starting out. I do read a lot of picture books, of course, but literary fiction is usually what I’m drawn to when reading for pleasure. I currently have quite an eclectic stack on my bedside table. The complete works of Truman Capote, Annie Proulx’s Barkskins, June Caldwell’s Room Little Darker, Daniel Clowes graphic novel ‘Patience’ and Emma Donoghue’s new children’s book The Lotterys Plus One. I think my favourite novel might be Postcards by Annie Proulx and my favourite book from childhood is A Little Princess by Frances Hodgson Burnett. I’m very excited to have been commissioned to write another book ‘as Gaeilge’ so I’m working on producing something special for that. I have one story written about a girl who wishes she was very small, but I have a few other ideas too and I’m using the opportunity to develop as many of them as possible! Thank you, Sadhbh, for sharing your writing life with us. Sadhbh's book is available at all good bookshops and also via the publisher, Futa Fata. For the past year I have been Writer in Residence for Dún Laoghaire Rathdown, based in the stunning Lexicon Library beside the sea. During this time I've been hosting book clubs, writing clubs, events and drop in writing clinics for children of all ages, from babies and toddlers up to teens. My term has now finished so this is my farewell post. 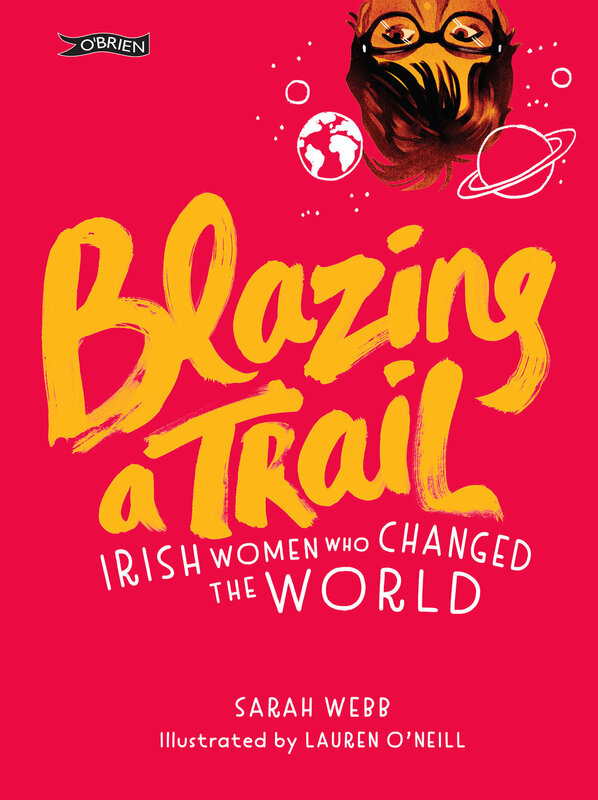 I finished a book, A Sailor Went to Sea, Sea, Sea, out on 11th September, wrote a second book, Blazing a Trail: Remarkable Irish Women Who Changed the World (out in 2018), came up with 3 further book ideas - 1 is about to be signed by O'Brien Press, I'm still working on the other two, and I also write a children's play. So plenty of writing! I also worked with some inspirational young writers in the dlr Lexicon Young Writers' Club and in the Drop in Writing Clinics. Amazing children with such imaginations! I especially enjoyed watching helping one young writer achieve the target we set at the first Drop in Clinic - to finish her first book. Over the year she wrote two and proudly read from one at our end of season young writers' prize giving and reading. I've always loved this Picasso quote - he's so right! The young writers in the Writing Club are fearless, the pieces they write are honest, moving, original, and in many cases also extremely funny. They know they can write and write they do! They pick up their pencils and as Seamus Heaney once said, they dig. 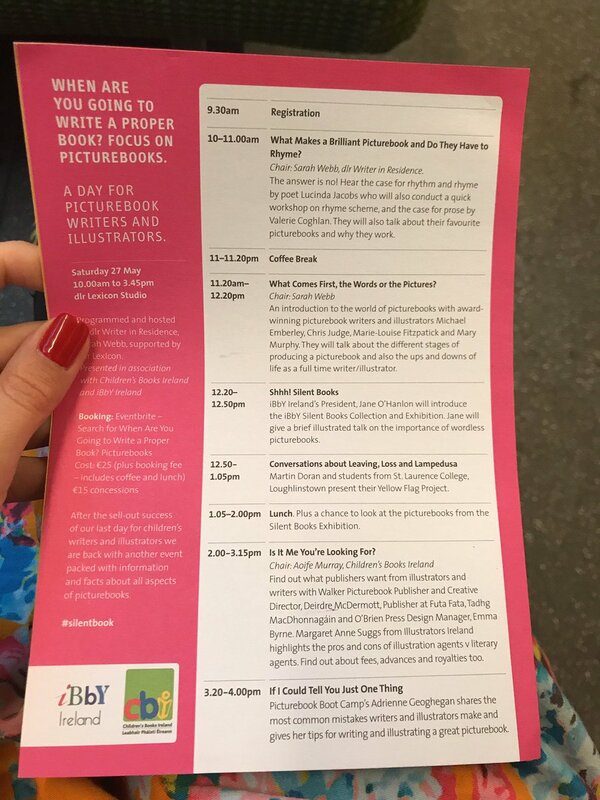 I also organised events with Lauren Child - the current UK Children's Laureate, Judith Kerr - the author of The Tiger Who Came to Tea, who at 94 is still writing, Chris Riddell - ex UK Children's Laureate, Eoin Colfer and Marita Conlon-McKenna. I adored curating The World of Colour exhibition - the work of Beatrice Alemagna and Chris Haughton, two of my favourite picturebook makers of all time. Marian Keyes helped me put together the exhibition and we had a wonderful launch after an event we held with Children's Books Ireland, When are You Going to Write a Proper Book?. Here's me at the launch of The World of Colour Exhibition, with Rosie again! I'd like to thank the people who made the year possible: Mairead Owens, Marian Keyes and Susan Lynch at the Lexicon who did so much to help me feel at home and to support my activities. Susan put a huge amount of work into the year and special thanks for all her input and ideas. When I came to her or Marian with a plan, they rarely said no. Thank you for having faith in me! To the Lexicon library staff, especially Lisa, Vita, Helen and Shelley, fellow children's book fanatics. 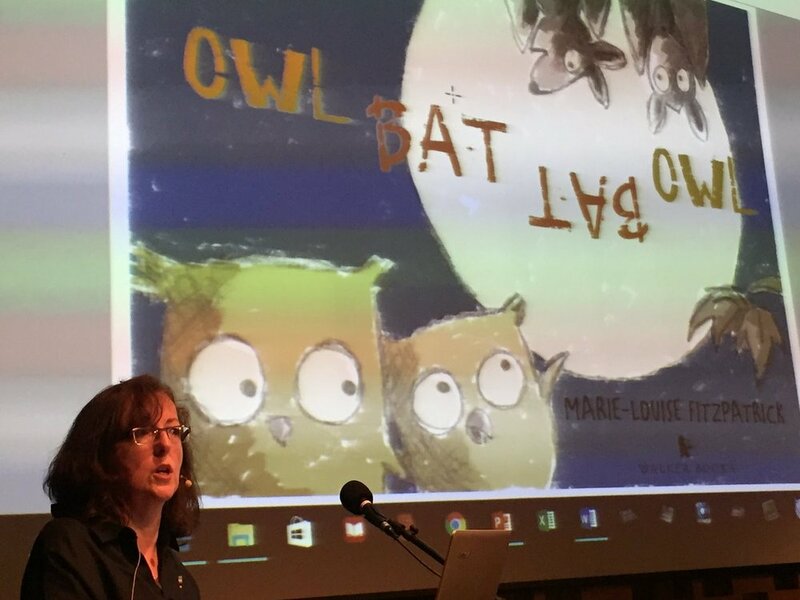 It was a pleasure talking to you all about children's books. The librarians, security guards, cleaners, staff at Brambles, to a person they were all so nice to me and so helpful. Nothing was ever too much trouble. One of the librarians, Nigel, helped me source books for Blazing a Trail which was invaluable. I'd also like to thank all the parents, grandparents, aunts, uncles and friends who brought their charges to the library to meet me. They say it takes a village to raise a child, well I think it takes a library to raise a creative child. And creative children who get the chance to express themselves, their authentic selves - and that's what I tried to encourage in the Writing Club, for the young writers to use their own unique voice in their work - they are lucky children indeed. Another highlight was writing a poem for the President of Ireland with the children at Shanganagh Park House in Shankhill - he was visiting to celebrate their work over the years. It's called I am Shanganagh and the President read from it during his speech. 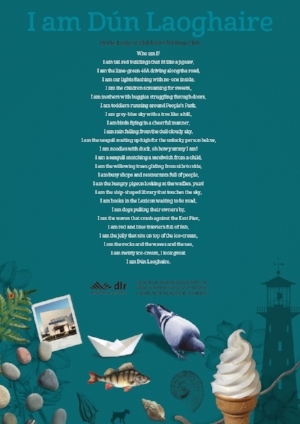 Lucinda Jacob helped greatly with this poem and also the I am Dún Laoghaire poem below. Thanks to Lucinda for all her hard work. It's been a wonderful year, full of discovery. I really enjoy working with the dlr Lexicon Young Writers, they are so full of optimism and wonder, and have such brilliant ideas. I will continue to work with young writers independently in the future. I have recently set up my own organisation, Story Crew: Write, Draw, Create, to provide writing clubs and creative workshops for children. We will also provide courses and workshops for adults who love writing for children. More details here. I loved working in my special room in the library - what a privilege - and got lots of work done. I found the evenings, when the library was quiet highly productive and spent many happy hours working on new ideas. I greatly enjoyed working with colleagues who love children's books as much as I do. I was a bookseller for many years and still work as a consultant to an independent book chain and I've always enjoyed working with other people. Being a writer is a lonely old job and it was so nice to be surrounded by interesting, engaging people. (Sorry if I asked you all too many questions!) I will miss that daily interaction. Overall it has been a highly positive and enriching experience for me. Would I do it all again? In a heartbeat! But it's time for the 'adult' writers to get a look in now. I hope I served the children and children's writers of Dún Laoghaire well. Goodbye, Lexicon. I won't be a stranger! Words Ireland are looking for writers to mentor emerging writers - see below. I really enjoy mentoring and you might just too. If you would like some help they are also looking for 'mentees'. Details here for both schemes. Words Ireland – a collective of seven Irish literature organisations – is initiating a total of eleven literature mentoring relationships in 2017, six of which are offered in partnership with the Arts Offices of Leitrim, Limerick, Kilkenny, Wexford, Wicklow, and the Arts Office and Libraries of Dún Laoghaire-Rathdown. Words Ireland are seeking expressions of interest from experienced and established writer-mentors working in the areas of adult fiction, children’s/YA fiction and/or poetry to undertake the mentoring of writers of promise who are working in the same forms. We are also are also seeking writers of adult fiction, YA fiction, children’s fiction and poetry to apply for mentoring support under our National Mentoring Programme. There are a total of 11 mentee opportunities open to writers resident in any county in Ireland, north or south of the border. dlr Libraries are delighted to announce an opportunity for authors, artists, lecturers, facilitators, workshop leaders and enthusiasts to submit proposals for events in dlr Libraries during the period 2017-2019. Events encompass workshops, talks, courses, shows, productions, classes, exhibitions and any other creative enterprises envisioned as a possibility within a public library context. As well as proposals suitable for festivals such as Bealtaine, Children's Book Festival, Science Week, we invite proposals for a wide range of one-off events, a series of themed talks/events or more long-term projects. Projects can include artistic, cultural and educational forms and target user groups can be children, young people, adults, users with special needs and intergenerational audiences. Proposals will be selected both from artistic/cultural and educational areas of interest, highlighting the demand for both kinds of events in dlr Libraries. Creative practitioners and facilitators that are successful in their application will be selected for a panel for use and events will be programmed accordingly from Autumn 2017 – Autumn 2019. Blackrock, Cabinteely, Dalkey, Deansgrange, Dundrum, dlr LexIcon, Shankill and Stillorgan. dlr Libraries have a tradition of providing high quality cultural programming that complements our collection and enlivens our spaces, both physical and virtual. dlr Libraries’ mission is: ‘to connect and empower people, inspire ideas and support community potential’. dlr Libraries support lifelong learning and seek to develop a culture of creativity and innovation. Libraries have no boundaries and stimulate the imagination through the provision of a rich and relevant collection and an active, engaging culture and technology programme. Architecture, circus, dance, film, literature, music, opera, theatre, traditional arts, visual arts and crafts. Books & literature, literacy & numeracy, STEAM (science, technology, engineering, art & maths), creating in the digital space, using information technology, e-learning, health and wellbeing, local history & genealogy, general knowledge, sustainability & environment, exhibitions. Delivery of all proposals will be remunerated in accordance with our current fee schedules for facilitators. If successful, dlr Libraries commit to hosting you during the time frame outlined, at a time that is mutually convenient. Interested applicants may apply for both areas of interest (artistic/cultural and educational) and all user groups. Evidence of experience with different user groups is an advantage. We request facilitators be flexible in their approach and responsive to the needs of participants. Selection will be based on the written submission and any additional supplementary material supplied only. Emailed applications will be deemed ineligible. Please submit 3 x hard copies of your proposal(s) along with 3 x hard copies of your curriculum vitae. Applications received after Friday 9th June at 12.00 noon will not be accepted under any circumstances. In accordance with the national Child Protection Guidelines “Children First”, the selected candidate will be required to follow child protection procedures as specified by Dún Laoghaire-Rathdown County Council. The successful candidate will be required to undergo Garda Vetting. There may be a requirement under certain circumstances for personal insurance. The provisions of the Freedom of Information (Amendment) Act 2003 apply to Dún Laoghaire-Rathdown County Council. Applicants should state if any of the information supplied by them is confidential or sensitive and should not be disclosed to a request for information under the aforementioned Act. Applicants should state why they consider the information to be confidential or commercially sensitive. Facilitators may be paid via the payroll system. They will not become employees of Dún Laoghaire-Rathdown County Council and are treated as employees solely for taxation purposes. Standard deductions will apply.